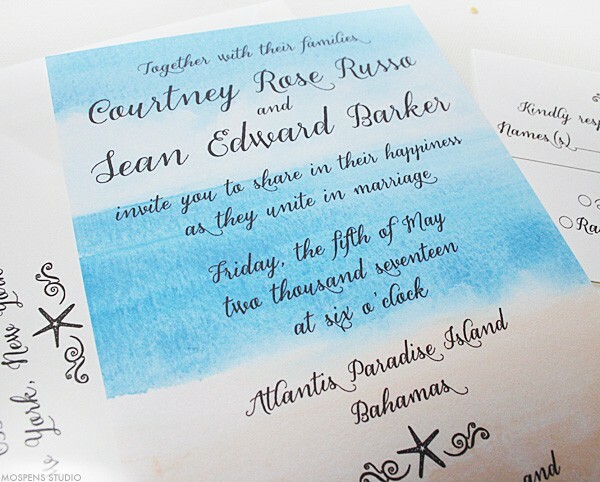 A watercolor design is just perfect for a beach wedding invitation! It is so hard to believe my first watercolor wedding invitation was designed more than a DECADE ago. 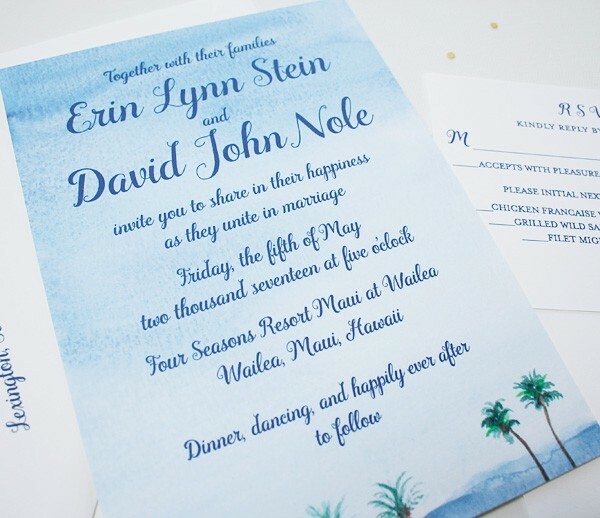 Today, I present 4 new beach chic custom wedding invitations perfect for a destination wedding on the beach! Think Hawaii, Bahamas, Mexico, and more. 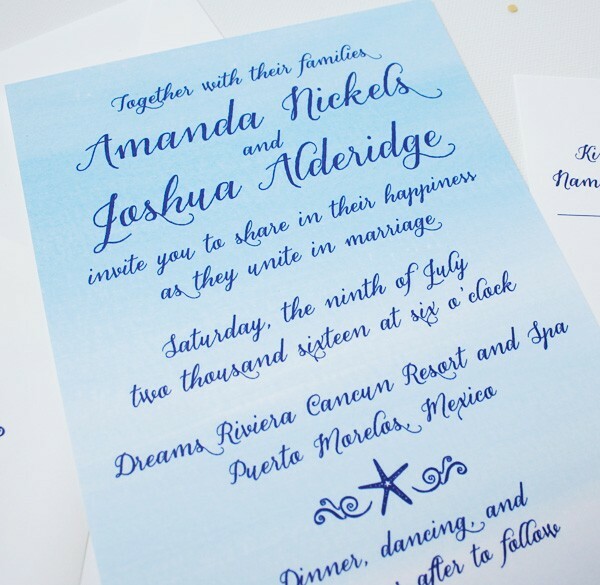 As always our custom wedding invitations can be personalized and customized to match your personal wedding style. Add a hand-illustrated seashell, remove the starfish, make the turquoise light blue, … you get the idea! Planning your fall wedding? 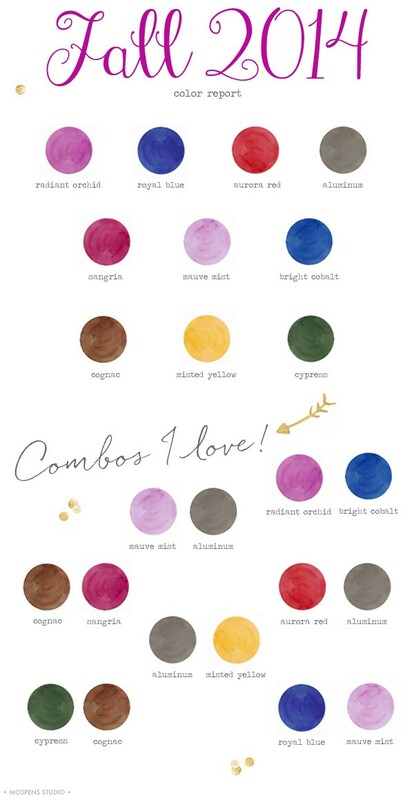 Pantone recently released their TOP COLORS FOR FALL 2014 with loads of gorgeous rich colors for you to choose from. I know Spring really has just sprung, but I had to share these beautiful fall hues for those of you planning your fall weddings. I have ALWAYS I love Sangria … rich magenta pink with a splash deep violet hue. Radiant orchid, was named color of the year, and looks amazing with orange for a fall wedding. Mauve mist and aluminum colors are a perfect combo for a late fall wedding. Enjoy! Remember, when planning your fall wedding your many have to choose main wedding colors your florist and linen vendor can supply you with. Then add the 2014 fall colors as accent colors where you can for a fresh and modern look. Just ask your vendors, they are always happy to help match your wedding colors! Have fun! Friday I’m in LOVEEE! NOW TRENDING! Hand-lettered inspired calligraphy fonts. I adore all things calligraphy. In my spare time when I am not drawing or painting you will find me practicing my hand at calligraphy with a pointed pen and paintbrush. Hand-lettered scripts are flirty and fun! 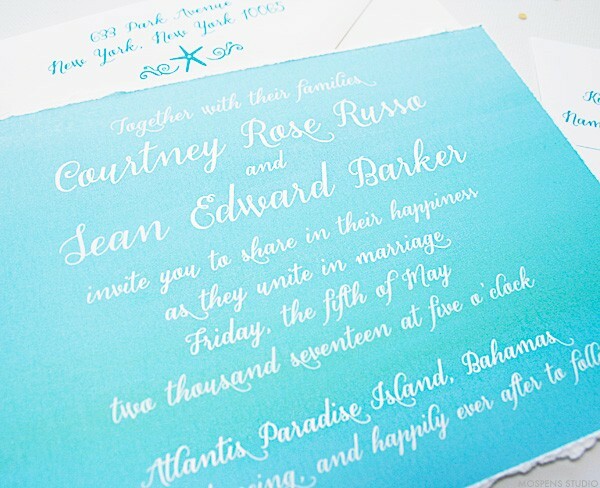 Colorful calligraphic swashes add handcrafted elegance to your wedding invitations and stationery. I have MANY brand new calligraphy style fonts I love, so I narrowed down to the ones I didn’t share yet. (i think!) I hope you enjoy them too. 2. Anna Clara – Let’s face it. This hand-lettered font is just right! 3. Ahra – Oh so lovely upright calligraphy swashes! 4. Ondise – Beautiful and thick calligraphy style font. Ahhhhh! 5. Aleka – Fresh and friendly handlettering perfection! 6. Ciao Bella – Simply elegant with flat and perfectly curved pen strokes. 7. Gardeny – Swirly artful and sweet calligraphy style font. Happy Friday to you and have a lovely and the most amazing weekend! 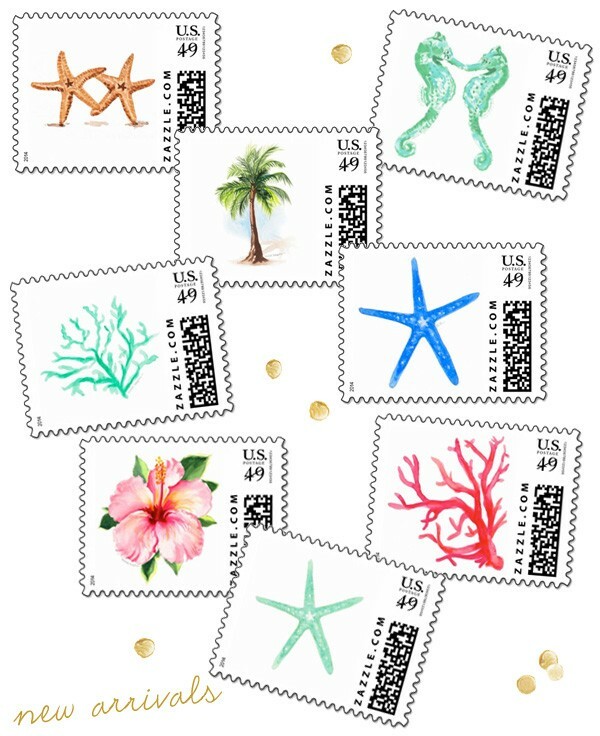 Loads of NEW watercolor postage stamps were added to my zazzle shop. Check it out, I promise you won’t be disappointed. 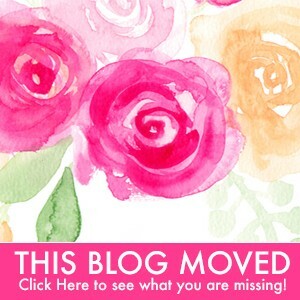 Match your wedding stationery, invitations, stationery note cards, and bills! Add a splash of color to your snail mail. Enjoy! Nautical themed weddings are super hot this year! Perfect for a nautical wedding in the spring, summer, or fall. The obvious color choice that goes perfectly with a nautical theme is navy blue, of course. To add a splash of modern fun I LOVE coral pink, lightest khaki brown, and metallic silver as the accent colors. Navy blue stripes on the cake and tables are a MUST! Sources: Nautical wedding cake photo by Miller + Miller Photography, nautical wedding reception decor photo by Josh and Rachel Best Photography, nautical wedding invitations by Mospens Studio <3, creative khaki suite, coral tie, and the elegant pacific blue bridesmaid dress by the amazing jcrew, nautical watercolor stripes artwork by Michelle Mospens (that’s me!). Tip! When working with stripes for your nautical event, use them sparingly. Remember less is more. Think cake, and table runner. Now that is nautical perfection! When considering bridal shower invitations, it is important to keep the unique theme and color scheme in mind. 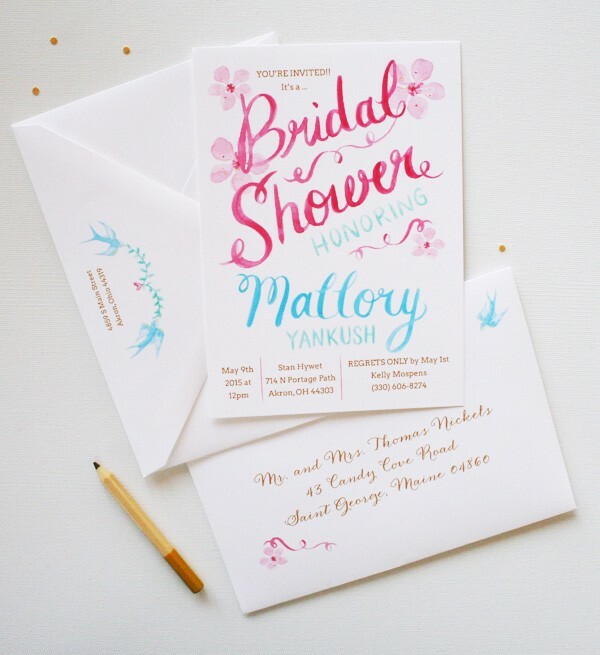 If you’re like us, we ADORE hand-painted watercolor wedding shower invitation designs! No matter your shower style, we have just the perfect invite for you. Completely customizable designs. 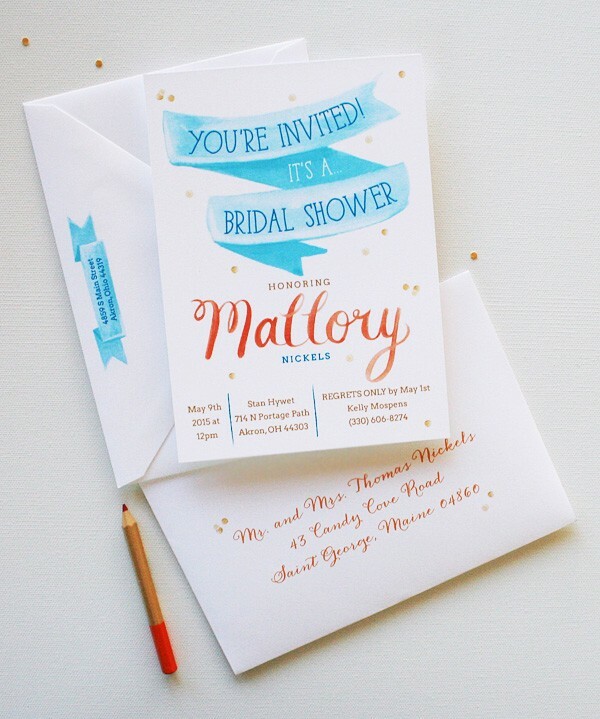 Following are 8 bridal shower invitation ideas to get your creative juices flowing. 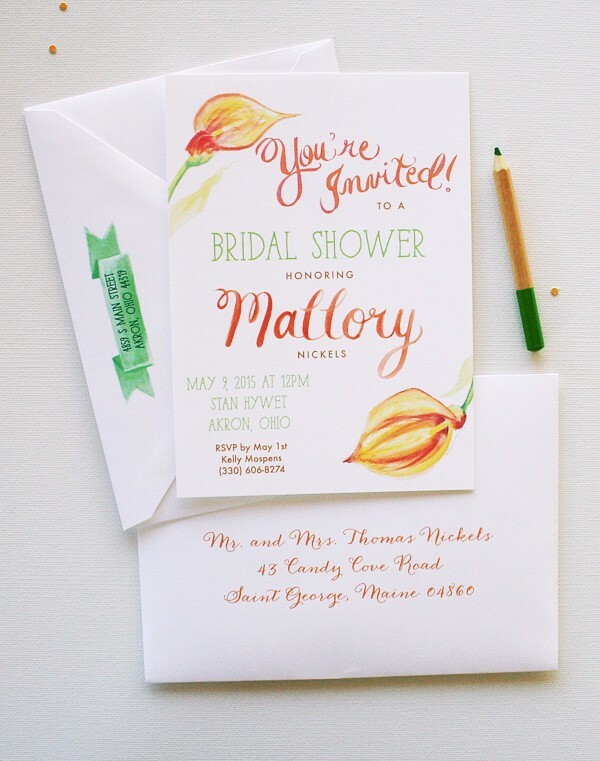 Hand-painted watercolor lettering makes this shower invite truly unique! Watercolor ribbon and handlettered name? Yes. Please. Orange calla lilies are fresh with green accents. Perfect for a spring or summer shower! 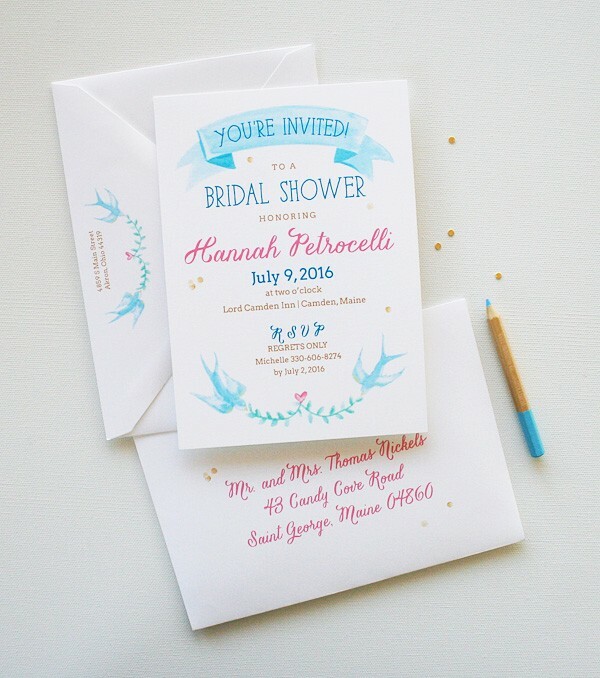 Beautiful blue watercolor birds and ribbon create the perfect shower invite. 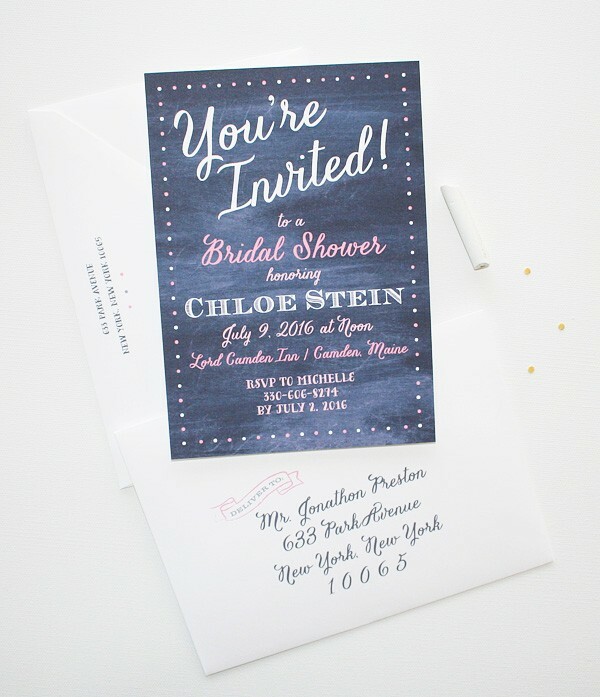 The oh-so-popular chalkboard bridal shower invitations for the vintage themed shower. 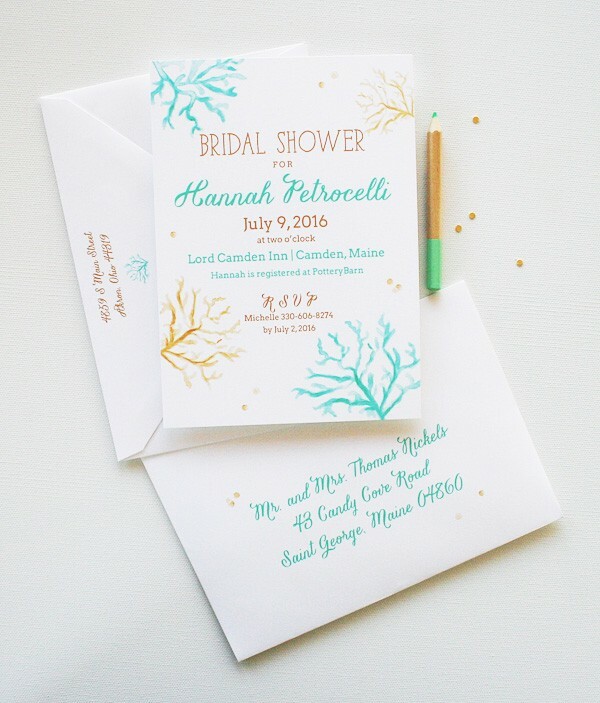 Mint and gold watercolor coral make this the perfect beach theme bridal shower invitations design! 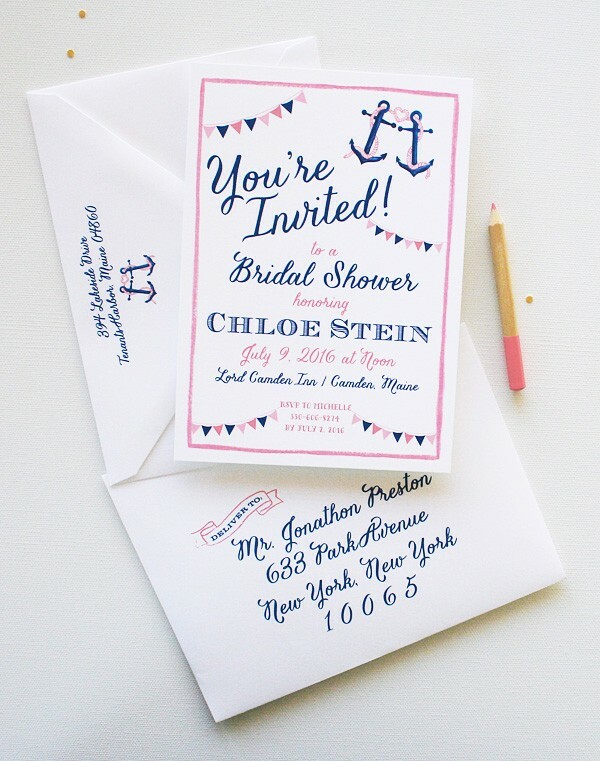 Nautical anchors and bunting scream fun on our preppy bridal shower invite. 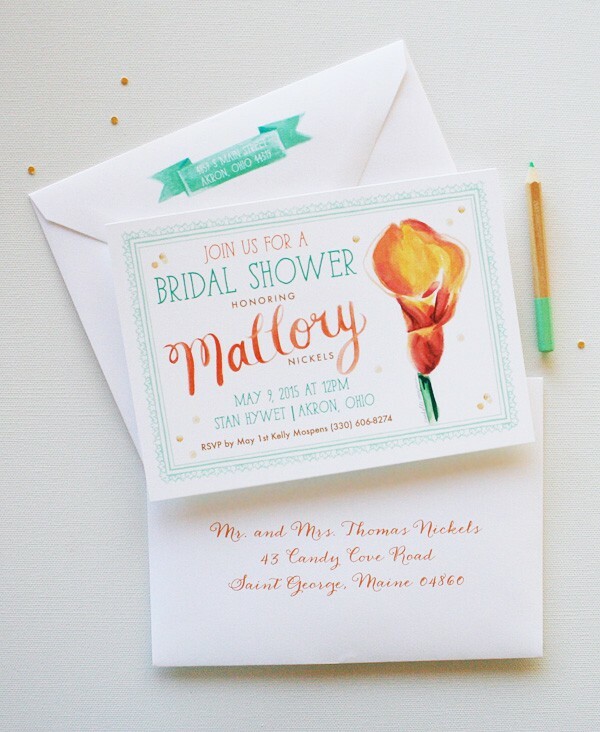 Orange calla lily and mint hand-painted vintage border and lettering make this shower invite modern and fresh! All of our unique custom bridal shower invitations can be customized and personalized for you. 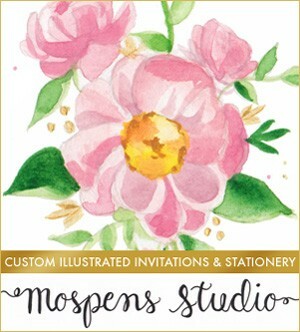 At Mospens Studio, custom designs are welcome … as always! Just contact me today.